Help make 4-way intersections safer with a traffic light system that detects motion in the traffic lanes and triggers light changes between red (stop) and green (go) based on primary and secondary lane priorities. 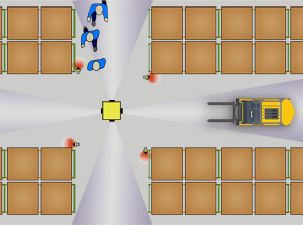 Enclosed, ceiling-hung sensor module detects motion in the monitored lanes. 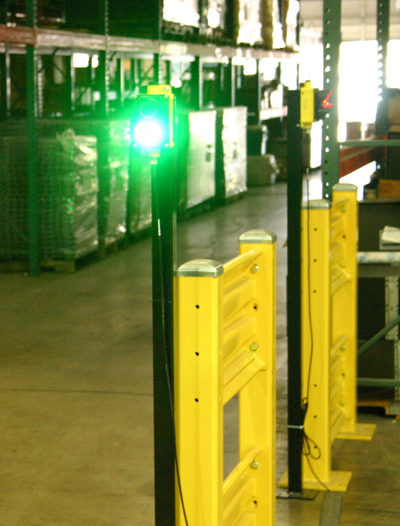 Lights are mounted on pedestals at a height easily seen by forklift drivers and pedestrians. This system does not provide physical barriers to block traffic. When crossing an intersection, always do so with caution and follow standard safety procedures (slowing, visual scanning, honking, etc.). 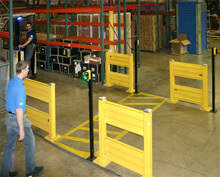 Pedestal Base Plate: 4" x 4"
System is tested prior to shipment. This traffic control system is set with a green light priority for the primary traffic lane, meaning this lane will have a green light unless motion is detected in the secondary lane. 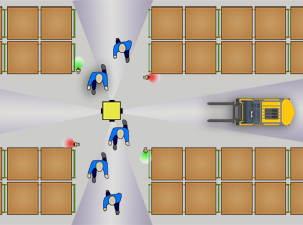 When motion is detected in opposing lanes, the system triggers a change in light status. Preparatory to allowing the secondary traffic to flow, all lights are red for a few moments to allow traffic in the primary lane to stop or clear the intersection, as needed. This also allows the secondary lane traffic time to gear up for moving forward. When the green light is given to the secondary lane, that traffic may move forward. The light will remain green until all traffic in that lane has cleared the intersection, at which time all lights will switch to red prior to returning priority to the primary lane, giving it the green light.